This Easter, audiences at PLAYHOUSE Whitley Bay, will set off on a magical adventure, over the rainbow. 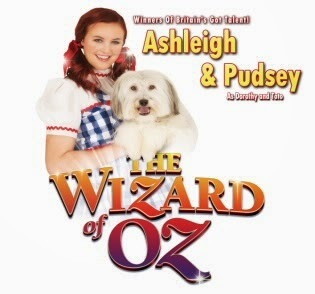 The wonderful Wizard of Oz, starring Britain’s Got Talent winners, Ashleigh & Pudsey is brought to the stage by Shone Productions, this Thursday 9th & Friday 10th April. Recently seen on CBBC with their hit series ‘Who let the dogs out?’ Ashleigh & Pudsey are starring as Dorothy & Toto. Joining them is the hilarious Lloyd Hollett as the Scarecrow and Hollyoaks’ Laura Handley as the Wicked Witch of the West, who is determined to foil their quest by any means necessary! Join Dorothy and her little dog Toto as they journey down the yellow brick road to see the great and powerful Wizard of Oz, meeting lots of new friends along the way; the bumbling Scarecrow who is desperate for a brain, the Tin Man who wants a heart and the Cowardly Lion who needs some courage. So click your heels and head down to PLAYHOUSE, Whitley Bay this Easter.